Vocal Alchemy's 15th Anniversary Season will feature three concerts including a Gala at the Winspear. Vocal Alchemy’s 15th anniversary gala celebration was a musical feast for the ears as we took our annual orchestral-work concert up a notch with a performance at the spectacular Winspear Centre. Music of Mozart for large choir, orchestra, and soloists was paired with a variety of a cappella and accompanied selections, including the premiere of a newly commissioned work by Canadian composer Mark Sirett. 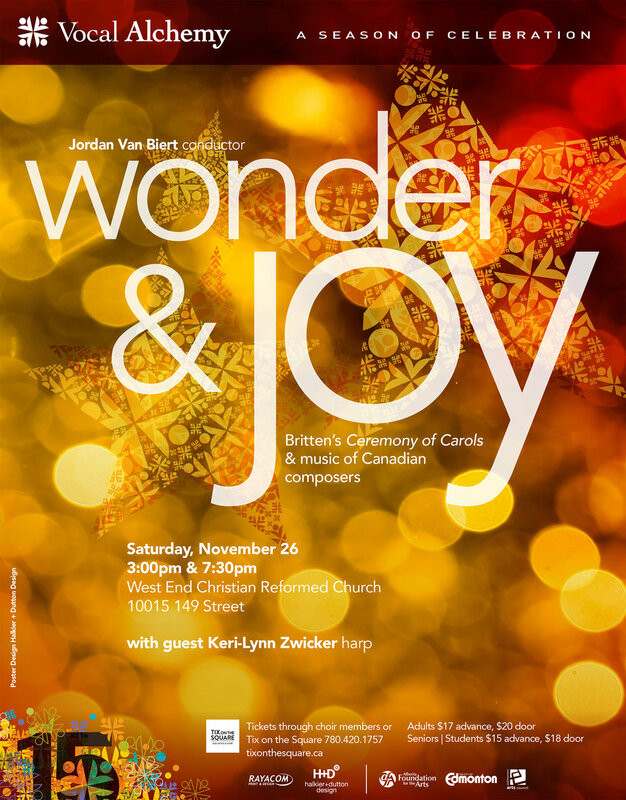 We were joined by Chronos Vocal Ensemble, the Alberta Baroque Ensemble, and four fabulous soloists. It was an exciting milestone! Vocal Alchemy looked back at our 15 year performance history, and brought choir and audience favourites out of the vault, and polished up some brand new items. This program featured the great variety of genres and styles we love to sing: classical and baroque music, contemporary pieces with piano, folk songs, and spirituals. We welcomed special guests, Ante Meridiem, and a guest rhythm section that got toes tapping. The concert also featured a performance by the men of VA and friends. Vocal Alchemy's 15th Anniversary Season kicked off with a performance of Ceremony of Carols, one of the first major works we ever performed (2009). We were joined by harpist Keri-Lynn Zwicker, who has played with us in many holiday concerts over the years. Two shows, afternoon and evening, were held at West End Christian Reformed Church.